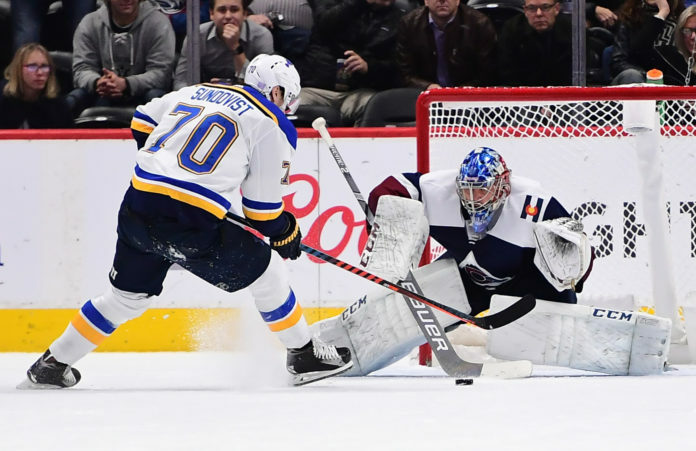 The Colorado Avalanche finished up their brief two-game homestand facing off against the Central Division rival St. Louis Blues. The last time these two teams faced off in the Pepsi Center, the Avalanche ended the Blues’ season with a win. 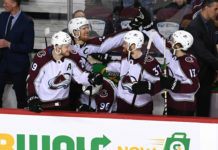 The Blues used physical play and that chip on their shoulder to out-muscle the Avalanche with a 3-2 victory in overtime. The Blues brought that bad blood from last season to this game early, as they threw their bodies around a lot in the first half of the first period. Colorado failed to convert on an early power-play, giving St. Louis the advantage in the momentum department. Vladimir Tarasenko proved to gain the most from that momentum, as he took advantage of a bouncing puck at the blue line, squeaking a five-hole goal past Semyon Varlamov to give the visitors the early advantage. Erik Johnson was ejected for an elbowing penalty, putting Colorado not only down a man for five minutes on the penalty kill, but also short one defenseman for the remainder of the contest. From that point, the Blues would take possession of the momentum until early in the third period. Alexander Steen would add one more on a power play to give St. Louis a two-goal advantage heading into the first intermission. The Blues figured out a way to get the Avalanche off their game, by playing physical and limiting the speed of Colorado’s top line. This style of play, the Avalanche weren’t accustomed to playing in and threw them off most of the game. Nikita Zadorov added a goal early in the second period after the Avalanche started the period fast and in their style of play. It seemed as though the only time Colorado was able to get any momentum was when they used their speed and controlled the puck. The Avalanche started the third period just like the first, with speed and puck control, and yet again they would find the back of the net. 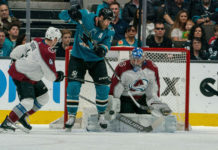 Mikko Rantanen buried a rebound to tie the game at two, which proved to be the final goal of regulation hockey and send the game into overtime. However, the Blues regained control of the momentum in the extra frame and Colton Parakyo ended the game. Despite the loss, Coach Jared Bednar said, “It’s a big point. An important point.” This point moved Colorado into a tie for the West with Nashville at 35 points. The Avalanche head on the road to take on the Detroit Red Wings on Sunday, Dec. 2. Puck drop is set for 5:00 p.m. MT from Little Ceasers Arena.